It's not just about the 1970s. 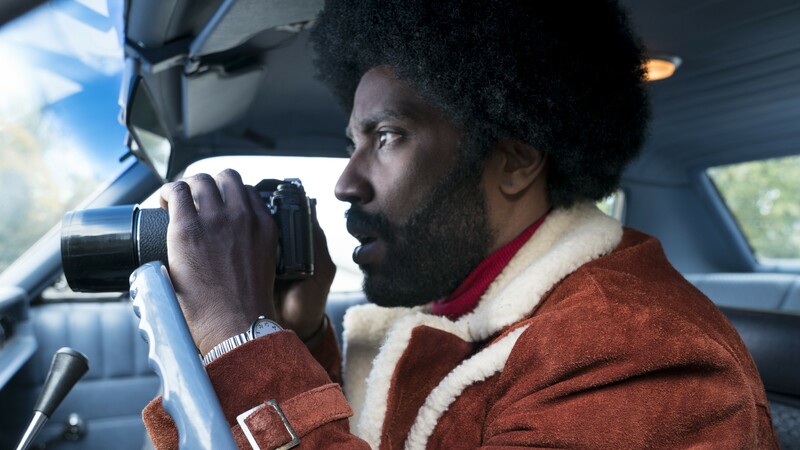 John David Washington surveils the Klan in BlacKkKlansman. It's been noted before, but the "Oscars So White" protests of 2016 have had a remarkable effect on the entertainment scene. A new wave of talented African-American creators has arrived with relevant issues on their minds, and with perfect timing. Their voices need to be heard immediately. But not all the most talked-about Black filmmakers are newcomers. Spike Lee, director of the thrilling new drama BlacKkKlansman, has been making films since 1979. He's responsible for some of Hollywood's most provocative, socially aware movies, among them Do the Right Thing, Malcolm X, Summer of Sam, and When the Levees Broke. BlacKkKlansman fits the portfolio with a vengeance. Lee and three other writers adapted the screenplay from a true-crime book by former police officer Ron Stallworth, and the result is one of the clearest, sharpest cinematic protests of recent times, an outraged but also appropriately humorous putdown of the current subculture of hatred. That hatred, as we all know, goes back to the beginnings of this country. Whether they realize it or not, ordinary Americans are neck-deep in a river of racial animosity and injustice, and always have been. Maybe Lee's latest can help rescue us. It's Colorado Springs in the 1970s. Ron Stallworth (John David Washington) answers a recruiting ad from the police department promising equal opportunity for minorities. Stallworth turns out to be one of the smartest officers on the force, but he suffers racial abuse from some of his fellow cops. At one point Stallworth goes undercover at a speech by Black activist Kwame Ture, aka Stokely Carmichael. Ture's talking points make sense to Stallworth, but his real takeaway from the assignment is meeting Patrice (Laura Harrier), a committed revolutionary. Her Afro is even bigger than his. They hit it off, warily. That potential conflict of interest widens out when Stallworth gets the idea to infiltrate the local chapter of the Ku Klux Klan. As part of a sting operation, Stallworth engages Klan members on the phone in the guise of an eager new volunteer. Then, when it finally comes time to meet the "organization" in person, fellow detective Flip Zimmerman (Adam Driver) steps in, impersonating Stallworth while mouthing typically vile racial slurs. The investigation and the movie's plot proceed from there, with calamity always lurking just around the corner. Lee, of course, is sitting on a case of dynamite here. Issues involving the Klan, police officers, white supremacists, angry radicals, and people caught in the middle haven't disappeared in the years since 1979 — in many ways they're worse than ever. But Lee isn't intimidated. The hate speech is realistically nasty but our hero's efforts to catch KKK Grand Wizard David Duke (Topher Grace) are just as determined. The casting is brilliant. Actors Jasper Pääkkönen (Felix), Ryan Eggold (Walter), Paul Walter Hauser (Ivanhoe), and Frederick Weller (as bigoted cop Andy Landers) form a clownish counterpoint to Grace's Duke and his much more dangerous smooth corporate image. Corey Hawkins, in the role of Ture, delivers a particularly fiery speech on the Black predicament, one of the movie's highlights. Washington, Harrier, Driver, and Robert John Burke (as the police chief), meanwhile, act as reassurance — help is on the way.